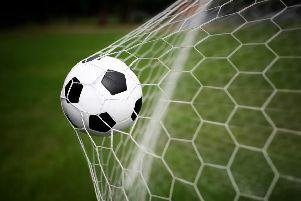 The early season feelgood factor at Hastings United Football Club has cranked up a notch after two more important victories over the past week. An incredible 4-3 Emirates FA Cup win away to higher grade Leiston on Saturday - when Hastings finished with eight men - was followed by a 2-0 Bostik League South East Division success at home to Horsham in front of a big Tuesday night crowd. Although the FA Cup win was more dramatic and exciting, Hastings manager Chris Agutter was more pleased with the subsequent league success. Speaking after the Horsham match, he said: “I get so much more satisfaction from that tonight than Saturday actually because this is our priority. As good as a good cup run is, we’re judged on how well we do in the league. “I think it will now be three weeks until we play a league game so I thought it was important to keep the pressure on Cray, who have obviously got a 100 percent start (until drawing 1-1 at home to Whyteleafe on Wednesday) and get back to winning ways in the league after the result after the result against Hythe (a 3-1 defeat on September 15). Agutter described the FA Cup victory as ‘the most ridiculous game of football I’ve ever been involved in’. “It was crazy,” he continued. “The manner that we won it ticked every box really. “When we were 11 v 11 we completely outplayed a team from the level above. If it had stayed 11 v 11, I was convinced it would’ve been five or six. Hastings lie second in the league with 15 points from a possible 18 and they’ve already netted 35 goals in all competitions. “I think you would take nine wins out of 10, I think it is in total,” Agutter went on. “It’s been a really good start without getting carried away and thinking we’ve arrived. “What we’ve done as well is we’ve used the whole squad and no matter how we’ve changed it, the side hasn’t really looked very different in terms of the level. Next up tomorrow (Saturday) is a Buildbase FA Trophy extra preliminary round tie away to Waltham Abbey, who are second in the Bostik League South Central Division. Agutter added: “There’s only one competition we can’t win and that’s the FA Cup; the FA Trophy, the Sussex Senior Cup, the league, the league cup, we want to win all of them. “This is the reason we’ve got a big squad. It may give the staff more headaches in terms of game-to-game squad selection, but ultimately it pays dividends really because we’re able to compete on different fronts.